Full Title: Lecturer of Information Technology. Bachelor of Science in Information Technology (Macon State College, now Middle Georgia State University, 2007). "I started working for Middle Georgia State University as a student at the technology help desk in the Library on the Macon Campus many years ago. 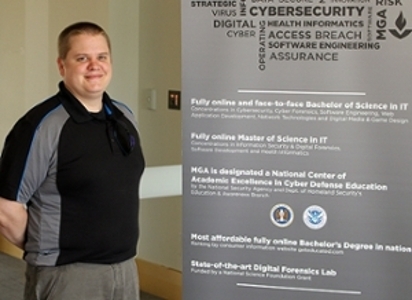 After graduation, I became interested in a position to be a web developer in the Office of Technology Resources. I served at this post for many years. Many things got accomplished during that time but I think the toughest project our team ever encountered was building a consolidated website for the two institutions that merged to become Middle Georgia State. We had a very tight deadline to provide a highly flexible website and we powered through it. 'Accomplishments' can be hard to define in the field of Information Technology; most people just expect things to work all the time and like to gripe about when it doesn’t. In that respect my biggest 'accomplishment' was that things worked most the time, I didn’t break things too often, and tried to keep everyone happy." "By 2015 I had started picking up adjunct courses teaching web development in the School of Information Technology. It has been an amazing experience to see students learn something new (like coding/programming) and build cool and interesting things from it. In fall 2015 I took the leap to full-time instructor and enjoy the experience of seeing students’ potential develop into real skills. With the new position I’ve been able to reach out to more students, see them move out into the community for employment and participate with the local school systems to promote STEM education in Middle Georgia. There is a big need in our nation to get students into software development, programming, and coding and it can be a very difficult field to excel in. Getting more people involved in my field feels like a natural calling in life." "I love the community at Middle Georgia State. I’ve had the pleasure of working with many different departments and administrators across the University over the years and I can truthfully say that I’ve always felt that decisions are primarily based on our students’ needs. Many people work extremely hard in lots of places to make sure tuition dollars are used effectively. We all believe in the mission to be a pillar to our community, educate, and transform lives for those willing to seek knowledge. Our faculty, staff, and administrators carry their badge of responsibility in this regard very highly." "As Yoda said, 'Do, or do not. There is no try.' Do not be afraid to fail. "I’ve been hustled off-campus for skateboarding at 3 a.m. more than once in my life."